Spring is the best season to be in New Orleans. Whether you’re a local or here on vacation, the festivals, parades, block parties, and live music around town provide copious opportunities to get out and enjoy the city. Be ready to eat, drink, and dance into the early days of summer with our guide to the best things to do between now and June. Music’s loudest acts light up the night at the Buku Music and Art Project, the annual EDM, hip-hop, and rock festival that’s been serving pounding bass and good times on the Mississippi Riverfront for six years. Art installations create a vibrant landscape to soak up between sets on the two-day blowout’s four stages, and headliners include Travis Scott, Deadmau5, and Run the Jewels. This seasonal treasure is a free two-act concert at Lafayette Square that’s perfect if you need a midweek musical jolt. Artists from all genres perform starting at 5pm each Wednesday through May, and food and beverage sales benefit the Youth Leadership Council. Irma Thomas and Jamal Batiste Band kick off the series on March 15 with another local favorite Kermit Ruffins performing May 3. Congo Square is the locus of much African culture in New Orleans, and its annual New World Rhythms Festival celebrates its rich history and spirit. Dance, music, and the Mardi Gras Indians fill the lineup, which includes sets by DJ Soul Sister and Rebirth Brass Band, African drum circles, brass band competitions, dance ensembles, and, for a real one-off great time, “The Low End Theory Players Present: A Tribute to A Tribe Called Quest.” Offerings by food vendors feature both traditional New Orleans dishes and Caribbean fare, and admission is free. While the Indians are much more visible at events throughout the city now, the biggest time to see the elaborately beaded and feathered tribes is on Super Sunday, which falls annually on the Christian Sabbath closest to St. Joseph’s Day -- and it just so happens that both fall on the same part of the weekend this year. A festival with bands will be held at A.L. Davis Park, and a parade snakes throughout Central City, where you’ll see plenty of pretty competition among the participants who’ve spent months hand-making their outfits. Crab is not the seafood normally associated with New Orleans, but that won’t stop these cooks. This season of Jazz in the Park, a free concert series each Thursday in Louis Armstrong Park, opens to coincide with the first Treme Crab Festival on March 30, when local restaurants will set up and show off their best crustacean cuisine. Jazz in the Park’s free concerts run through June 1 with the usual suspects, including the Preservation Hall All Stars, Treme Brass Band, Rebirth, Ruffins, Little Freddie King, and more. This annual free festival celebrates the Freret neighborhood right in the heart of New Orleans. Three stages of music, dozens of local art, food and drink vendors, pet adoptions, and more span the six blocks between Napoleon and Valmont. Bring your family and friends to bask in the street’s warm and welcoming vibe. 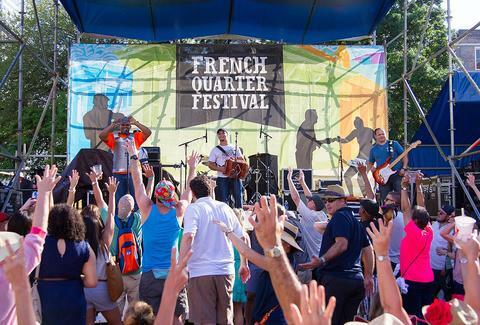 The French Quarter is known for being filled with music and bars, but the French Quarter Festival amplifies it even more, with over 300 hours of free music in just four days. Crowds of thousands fill up the streets of the Vieux Carre as over 170 Louisiana acts play 23 stages erected around the historic neighborhood. Each year the Louisiana Philharmonic Orchestra teams up with City Park to provide a free concert on the park’s Woldenberg Great Lawn. Concertgoers can bring chairs and blankets to enjoy the Orchestra’s stylings of well known modern and classic hits. There’s also the option to pack a picnic, or purchase food and beverages from one of the many vendors. The Botanical Gardens, just across from the lawn, play host to an Earth Day event, featuring green-living educational courses and children’s entertainment, from 4 to 7pm before the concert. Jazz Fest brings local and global acts to the city’s fairgrounds for two weekends of music. In spite of the festival’s name, the massive party includes artists of all genres and demographics, with this year’s headliners including Stevie Wonder, Tom Petty, and, yeah, Maroon 5. The jam-packed city is extra celebratory as bands in the lineup often play secret shows around town, but even just a day on the grounds is enough to wear you out, in the best way possible. Bayou Boogaloo is similar to other music festivals around town -- four stages, arts and crafts tents, and vendors galore -- but it has the added benefit of being on the waterfront. Bring your own boat to cruise around the bayou between stages and soak in the final days of season with this laid-back, ever-growing free event. The long-running festival at the Holy Trinity Cathedral, now in its 44th year, promises food, drink, and activities for Greek enthusiasts young and old. Check out traditional Grecian music, eat tons of dolmas, and try to count how many times you hear “opa!” On Sunday, there’s a toga contest, but even if you don’t enter, wearing one of the traditional garments will gain you free entry. Emma Sloan is a freelance writer in New Orleans. She will definitely get sunburned at least once this festival season. Follow her at @emmuuuh.